Just in time for Mother’s Day weekend Cars.com has released a study that finds nearly three quarters of moms consider themselves the “sole decision-maker” in the car shopping process. As I’m sure you’ve experienced, growing your family often necessitates a new car purchase to make room for car seats, car pools, etc. 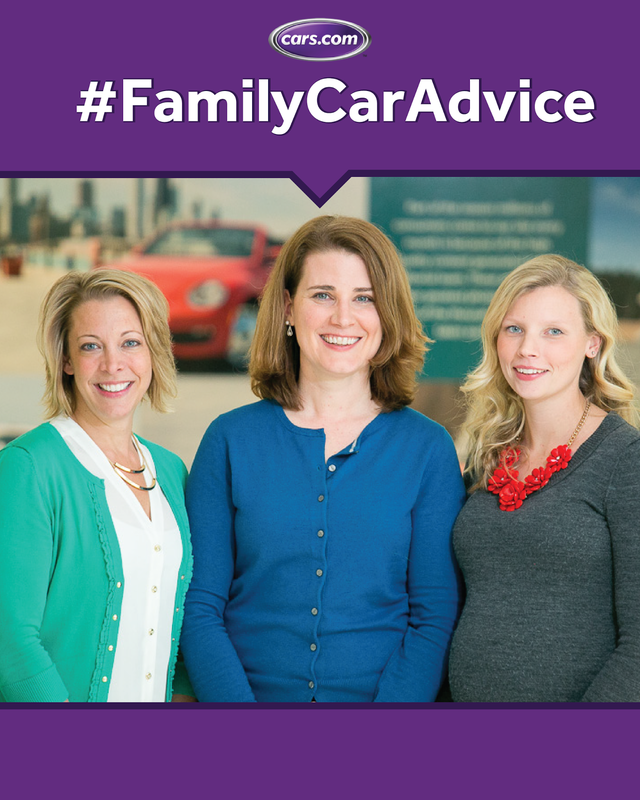 This year Cars.com has launched a #FamilyCarAdvice campaign to help parents with these decisions, and created an online portal – Cars.com/Family –to make all of this information easy to locate. Cars.com is an award-winning online destination for car shoppers that offers information from consumers and experts to help buyers formulate opinions on what to buy, where to buy and how much to pay for a car. Cars.com offers thousands of new and used vehicle listings, consumer reviews, side-by-side comparison tools, photo galleries, videos, unbiased editorial content and many other tools to take the drama out of car shopping. Nearly three of four (73%) moms consider themselves to be the “sole decision-maker” in the vehicle shopping process, according to an independent study by C+R Research, commissioned by Cars.com. As a growing number of consumers turn to online resources for information and transparency when making major purchases, women with children have emerged as a highly engaged group of shoppers. The study found that 71 percent of moms agree that shopping online for a new or used vehicle makes the process much easier, but more than half (68%) still prefer to conduct negotiations in person. Women with children desire long-term relationships with dealers, as the research shows that the majority (59%) prefers to purchase multiple vehicles from the same lot. The study, conducted by C+R Research, surveyed more than 1,000 shoppers, including 367 moms, who were planning to purchase a vehicle within the next six months or had done so within the previous six months. One person will win a $25 VISA gift card to help fill up your tank. My husband and I make a joint decision. We (my husband and I) are car shopping right now! We're heading out to another dealership this afternoon. My husband and I collaborate but we each make the final decision on our own vehicle. I have no say when it comes to car shopping. My husband and I decide together. my husband and I decide. I make my own decisions when it comes to cars. I am the sole shopper for a new vehicle. Hubby and I shop together! My husband and I and even our kids all shop together when we are looking for cars. I am the sole shopper. My husband and I work together when vehicle shopping. yes I am the sole decision maker when it comes to buying a new car. Me and my hubby choose together. my hubby and I make the decision together! My hubby and I make all decisions together! My husband usually gets ants in his pants and does it without me. I do the research but my husband and I make the decision together. I ask a male friend to help me with this. Hubby and I both decide. DH & I recently decided on the Ford Escape. Thanks! I'm on my own when shopping for a new vehicle. I definitely take the man car shopping. He is the one who does all our car repairs so he should be the one checking things out. My husband and I both go shopping for vehicles although, neither one of us is very good at it so we will probably bring someone else with us, lol! I dont drive or own a car. My husband and I both make the decision when buying a car. Whenever I've shopped for a car (even before we were married), my husband has always come with me. And now our children come, too. If they're going to ride in the car, I need to know that they're comfortable in it, too! Both of our vehicles have been given to us! I really don't drive too often because of my back spasms, but I do go with my daughters when they go car shopping and help guide them. I shop for my own car. If the vehicle is for me, I do the shopping. My husband and I make all vehicle purchase decisions together. My husband & I are currently shopping for a new car together! My husband and I go together. My hubby and I made the decision together. I am the sole chopper, single older mom. My hubby & I make the decision together! Hubs and I go through the process of car hunting together. Hubby and I make the decision. It is usually my husband and I who both decide what best fits our family for a vehicle. My husband and I do that together. My husband and I pick the vehicle together, but I get to pick the color all by myself. My husband and I purchase vehicles together. my boyfriend and I choose together. I would make the decision on my own for my family. I am the sole shopper for vehicles! My hubby works for GM, so he has alot of say, but for my vehicle, he lets me pick! I currently drive a tahoe that I love! I traded from an Acadia that I did not like so much. When the time comes, I am the solo decision maker about a new vehicle. My husband and I make the decision of buying a new vehicle together. I do all the research and car shopping and my hubby sweeps in at the last second to do a test drive.But ultimately, it's my decision. My husband and I would make the decision together. although my husband and I discuss it, I usually leave the decision up to him. It's pretty much dh's job. I get an opinion, but he mostly ignores it, lol. My husband and I make the decision together. My husband and I make large purchasing decisions together. However, if one person will drive the car more than the other, they get more say. If we were in the market for a new car, it would definitely be a joint decision between my husband and I.
I usually get several members of my family to help when looking for a new car. My husband and I make the decision together...the kids chime in their two cents as well. I'm the sole decider, although I do ask opinions of my family and check out Consumer Reports. My husband helps me with the decision. My husband knows more about that stuff! I have been the sole shopper of vehicles since my husband passed away 15 years ago. Both my husband and I shop for vehicles together. Someone else in my family helps. I do this with my guy. Hubz and I shop together for anything as large as a vehicle. We search online first. It works well because we have generally the same goals. I do a lot of research by myself online and then I call my dad and grandpa for more advice. If we would get a new vehicle, it would be a mutual decision. No, my dad or my husband helped me buy my cars in the past. It would be a decision made with my husband. My husband and I vehicle shop together. I have plenty of people to consult. I work at a dealership and my step-dad is a mechanic. It's a joint decision but my husband always checks it over good (mechanically) before buying. My husband and I both make the decision about the type of car we want. My husband and I both shop for our vehicles together. Someone else would help me. My husband and I make the choice together. My husband and I shop for cars together. My husband and I decide together on which car to buy. My husband and i both share in the decision making! My fiance and I would make a decision like that together. My husband and I shop together. I have to say neither one of us enjoys car shopping. I've never bought a car so I would definitely ask my Mother or brother for help. It is usually a joint decision to ensure I am getting the best deal. My parents help me decide a new vehicle. I have never purchased a car alone. Before I was married my mother and father helped me pick out the first two cars I bought and after marriage, my husband and I made a joint decision. Hubby and I shop together, thanks! My wife and I decide together. My husband and I shop together. I'm the sole shopper for a new vehicle, mostly because I'm the only one in the family who drives! Thanks for the giveaway… My wife & I have shopped for our last two vehicle purchases together. My husband and I make our vehicle decisions together. Thanks for sharing this! It is solely my task and decision. My husband & I shop together. I am usually the sole decision maker but occasionally my son will offer his opinion. My husband and I shop together for vehicles. I get a family member to help me figure out all the details. I like getting input!